My continuing meditation is still on hold while I soak up some serious Chicago. However, while I’m trying to keep non meditation posts in abeyance I really couldn’t help but comment on this story in today’s DNT. One of the chief beneficiaries of the Red Plan, the realtor for F.I.Salter, comments with concern about unexpected property tax increases. Looking at seven to eight properties his firm manages in Duluth, Sandy Hoff, president of F.I. Salter Co. Inc., said their assessed values have remained steady, but his tax bill has increased by about 5 percent across the board. “That creates a challenge for us as property managers,” he said, explaining that it’s difficult to pass on those expenses to tenants who are already struggling. He noted that next year’s property taxes look likely to grow at about double the rate of inflation. The state stopped paying down property taxes for qualifying residents and instead ordered local governments to exclude a portion of a home’s value from taxation. The exclusion program can lower, for taxation purposes only, a property’s value by as much as $30,400 for a $76,000 residence. The more a home is worth, the smaller a break it receives. The exclusion disappears altogether for houses worth $413,800 or more. The switch to an exclusion program reduced local tax bases, leading to double-digit tax rate increases last year in St. Louis County and around the state. Dicklich said the homestead changes had an especially large impact in St. Louis County, where relatively few residences are expensive enough to be ineligible for an exclusion. The close to half billion cost of the Red Plan has thus shifted more heavily to commercial properties which have none of these recent exclusions. There is some justice in this because residential property taxation is extremely regressive meaning that poor homeowners pay relatively more than rich homeowners or businesses. For a long time the state’s Chamber of Commerces have lobbied to lower commercial property taxes. These new state laws have inflicted serious taxation on Duluth properties which have been affected by the near half billion Red Plan costs which were strongly advocated by the local Chamber of Commerce. its called Poetic Justice. The grapic on the original site can be hovered over to get more detail. I found it interesting that in 1947, three years before I was born, 11% of consumer spending went to “government. Today’s figure is 13%. RUN AND HIDE EVERYONE! After the Cold War, the Federal Highway’s program, the Great Society and Medicare that seems pretty modest. I’m sure its more complicated than that. For instance, how much of “medical” spending is on Medicare? Its not quite eleven pm. I was putting the throw rug, now dry, back on the basement floor. While doing that and sweeping up the ceiling off the floor I watched the opening of SNL. It was a groady skit about a couple groady adults attempting to relive their groady teenage experiences. It was a reprise of some characters that haven’t been around for a while because the cast members have gone on to other things in life. Having just watched a decade old film that I’d always heard was fun, The Truth about Cats and Dogs, the evenings expectations had been raised to high to sink to what promised to be a less than stellar SNL. I’m not sleepy even though the day has seemed quite long. Two hours of mad mopping left me tired the rest of the day. I got a two-hour long reprieve when one grandson took a nap and the other went with his Grandmother to the latest Chipmunk movie. Chipwrecked is getting lousy Rotten Tomatoes scores but as Grandma said, she was taking a four-year-old to see it not a critic. But he’s probably creating jobs. I’ve been thinking for some time that Republicans who are crying out to keep taxes on the rich low so that the rich can create jobs may have overlooked the fact that lots of the jobs being created by them are overseas. That comes up in this brief post regarding the Apple empire. The income tax was dead. But the pressure to tax the incomes of the largely untaxed rich only increased, especially as the Progressive wing of the Republican Party grew in strength under Theodore Roosevelt. By the time of the administration of President William Howard Taft (1909-13) the pressure was becoming overwhelming. One representative suggested simply repassing the 1894 tax bill and daring the Supreme Court to overturn it a second time. Read John Steele Gordon’s whole column in the WSJ. …figuring out how this will affect your property taxes. It comes from Minnesota Public Radio. The DNT reported a while back that losing the homestead tax credit would cost Duluthians on average a 5.7% tax increase. That doesn’t include what the City of Duluth or the County or the Duluth School District or voters on a proposed operational tax levy increase in a coming referendum will do to bump up our taxes. You can see what would have happened in Duluth last year if the Dayton GOP legislative agreement had gone into effect by looking at this. Its a 900 page pdf that won’t easily transfer to the blog here without a lot of tinkering that I don’t have time to do for you, my dear readers. Page toward the end of the alphabetically listed Counties to St. Louis. Duluth is the last entry under St. Louis County. I love Steve Lindstrom cartoons in the Trib. His is a very stripped down strip. No clutter just simple visual metaphors. Today’s was another smart strip which I regret the Trib does not feature on its website for me to link to. It was about the recently chopped up homestead tax credit which I’d forgotten about when I blogged about the costs of school operating levies yesterday. I’d forgotten, because its hard to keep up with the GOP these days. Republicans took it away and poor homeowners will be hit particularly hard leading to a 5.7% increase in Duluth Area property taxes. This at a time when the County is bumping up its property taxes and the School District is asking the state to grant it a $15 million increase in Red Plan – with no vote of course, although the School Board will be asking voters for additional operating levies in a referendum. Lindstrom’s cartoon showed a cursing homeowner perched on his home’s roof watching as a smug Elephant, Republican legislators, walks away with his ladder labled “homestead credit.” The Pachyderm is repeating to himself, “I didn’t raise taxes.” It was ludicrous as a surgeon assuring himself that he didn’t make a patient limp by amputating his leg. — Seventy-one percent of current U.S. debt was accumulated during Republican presidential terms. — Two-thirds of debt-ceiling elevations since 1960 have been signed into law by Republican presidents. — In 1961 the percentage of corporate profits paid in taxes was nearly forty-one; now it is less than eleven. — Seventy-five percent of the increase in corporate profit margins since 2001 has come from depressed wages. 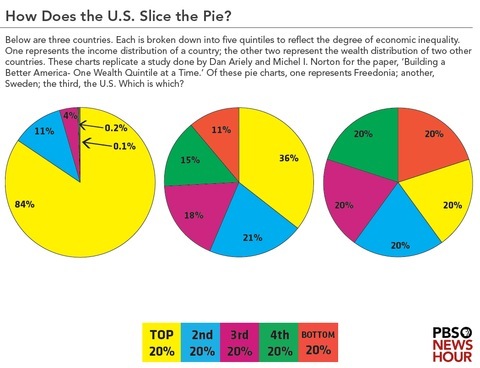 …and we aren’t quite so unequal here in America. A very smart report from the PBS News Hour from a favorite of mine Paul Solman. A friend sent this story to me about the Perham School district’s levy referendum. Its mostly correct and I suspect much of what it says is based on state laws and would relate to Duluth as well. It mentions that some kinds of “post secondary residential” properties are not taxed. If that’s so I’d be curious to know if that is a statewide exception or one that only applies to Ottertail County. Duluth has a lot of housing that might be described that way. I presume that single family homes that have become rental residences would be subject to school operating levies although only at the lower homesteaded rate (as second homes.) I’d guess a lot of the Duluth housing along Rice Lake Road for college kids might be exempt but I don’t know for certain. Sorry, I’m not going to research it. The story did get one thing wrong. I wrongly presumed that this explanation covered a “progressive tax.” It doesn’t. The Perham-Dent levy would cost $105 per year for properties worth $100,000, with that amount progressively rising as the market values increase â€“ up to $948 per year for a $900,000 property. In this example every $100,000 of value has the same flat $105 tax applied to it so that $900,000 in value would result in taxes of 9 x $105. In a real progressive situation there would be an increase in the property tax rate as the value went up. For example, at a $500,000 valuation the tax might go up to $125 for every additional $100,000 of valuation over $500,000. That would be a “progressive” jump. Minnesota property taxes used to be like that meaning that more expensive homes were taxed at higher rates. I wish it would come back. I suspect that a lot of folks in big Duluth houses were for the Red Plan and I’d like them to be pulling a heavier load. I can’t find the Trib’s story on American’s giving up hope of becoming millionaires on the DNT website but this seems to be it. While the GOP is hyperventilating about Obama stiring up class warfare I’d like to once again note that saving a million dollars over the course of one’s lifetime (which makes one a millionaire) falls far short of earning a million bucks a year. According to this story there are currently 5.2 millionaires in America. That is a far cry from 5.2 million American’s earning a million each year. Those are multi-millionaires. Obama is only going after them for taxes. If he can raise $1.5 trillion from them I say go for it. Pretty soon we may have to rephrase that Biblical story to make it about a Republican getting to heaven being as likely as a camel passing through the eye of a needle. As the GOP rushes to defend lower tax rates on millionaire “job creators” I can’t help but think about a half a dozen job creators I’ve talked with over the years who are busy making jobs in China because the Chinese can manufacture so much, so quickly and so cheaply. I’m pretty sure that Bernie Madoff, in his prime, would have appreciated Republican support as well plus all the well connected white kids who got generous scholarships to study at the Ivies on their way to becoming job creators. As for Pell Grants for everyone else. Not a big GOP priority. I had thought that Republican absolutism about taxes, while harmful to the country and out of sync with even the party’s own Reaganesque past, at least had the zealot’s virtue of consistency. Now we see that it can be set aside when it applies to poorer people, and when setting it aside would put maximum drag on the economy as a whole. So this means that its real guiding principle is… ??? You tell me.